Falmer, once known as Snow Elves, were thought to have been hunted to extinction by the Nords. They now live deep underground and have devolved into disfigured, violent remnants of their former selves, and their senses have adapted to a life in the dark. Their primitive weapons and armor are made from Chaurus chitin, and they often live near Chaurus, apparently keeping some of them as livestock. 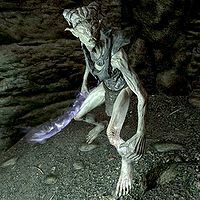 Despite their elvish heritage, the Falmer are considered to be creatures, not NPCs (and therefore they do not have black souls). They tend to prefer poisoning their weapons with toxins developed from both Chaurus and Frostbite Spider venom. They often make their lairs in close proximity to Dwemer technology, apparently unwilling to wander far from where their ancestors took shelter from the Nords. In dungeons, Falmer often emerge from hive traps to ambush you. Falmer are blind and hunt by sound. Although their hearing is very sensitive, their lack of sight can be used against them if you can move silently or attack from a distance. 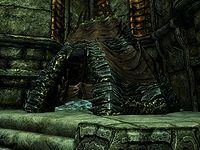 The Dawnguard add-on adds further depth to the history of the Falmer. Knight-Paladin Gelebor, one of two known surviving Snow Elves, recounts how the Snow Elves sought protection from their Nord enemies long ago. The Dwemer agreed to shelter them, but at a high cost: the Snow Elves were forced to eat a toxic fungus, which rendered them completely blind. This was an extremely unsavory choice in the eyes of many of the Snow Elves, but those who rebelled were either killed, converted, or ended up disappearing completely. In time, the Falmer became slaves to their Dwemer protectors. 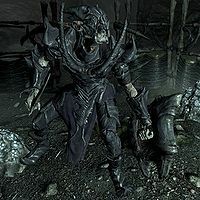 In light of their sad fate, Gelebor refers to the monstrous Falmer in contemporary Skyrim as "the Betrayed". 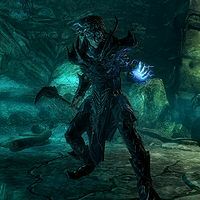 He also claims that the toxin the Dwemer used to blind them is not responsible for the sorry state of contemporary Falmer, and hints that the rest of the transformation can be explained by thousands of years of evolution. 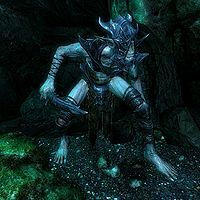 Falmer utilize a variety of fighting styles, including melee, ranged, and magic attacks. The specific variety you will meet is level-dependent, and you will continue to meet low-level versions even at high levels. Boss-level Falmer, however, will always be at the highest possible level. The Dawnguard add-on adds the Falmer Warmonger, which is one of the few creatures to have a grand soul. 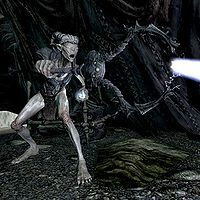 All Falmer are blind (80 pts) and have a Fortify Sneak ability (30 pts). Most Falmer you will encounter are male; in fact, the Falmer listed in the tables below are all male in the base game. If Dawnguard is installed, however, the Falmer shaman will all be female and wear a special female Falmer outfit (their gender is still marked as male in the game data, however; only the Falmer Warmonger shaman is actually marked as being female). Any Falmer that uses martial attacks (all types except shaman) also has a leveled "Falmer Poison" perk, which allows them to apply a leveled poison to their weapons. This poison is actually a spell that lasts for 3-4 seconds and causes a set amount of damage to health on hit (rather than damage per second over time). These Falmer prefer to fight up close, wielding a fearsome weapon in one hand and a shield in the other. In addition to a Falmer Shield, they carry either a Falmer Sword, a Honed Falmer Sword, a Falmer War Axe, or a Honed Falmer War Axe. Falmer of level 22 or higher (except Warmongers) will also be equipped with a Falmer Helmet. Falmer melee bosses have the same equipment and loot as the melee Falmer listed above, but appear at higher levels. At low levels, Falmer bosses can be much more difficult than normal Falmer; at higher levels, the bosses are actually lower level than regular melee Falmer, but have slightly higher stats. Some Falmer prefer to stay at a distance and assault you with missile attacks. These archers wield a Falmer Bow and carry 12 Falmer Arrows, and have a chance to carry a small number of other arrows (of any quality from iron to Daedric). Level 1 archers also carry a Falmer Sword, and any archer of level 22 or higher is equipped with a Falmer Helmet. Falmer shaman are skilled spellcasters, relying primarily on the use of offensive spells in combat. Although they do not know the Bound Sword spell, all shaman carry a bound sword with the following enchantments: Banish Summoned (an effect that functions like the Oblivion Binding perk), Soul Trap (5 seconds), and Turn Raised Undead (essentially a Turn Undead effect). Falmer shaman do not wear armor. If Dawnguard is installed, Falmer Warmonger shaman will appear starting at level 48. They do not wear heavy armor like their martial counterparts, but they do have a chance to carry either a Bound Sword or a staff of Firebolts, Ice Spikes, or Lightning Bolts. Falmer spellswords mix the martial attacks of their melee cousins and the magical attacks of the Falmer shaman. They wield either a Falmer Sword, a Honed Falmer Sword, a Falmer War Axe, or a Honed Falmer War Axe, and they do not carry a shield, preferring instead to keep a hand free for spells. Falmer of level 22 or higher (except Warmongers) will also be equipped with a Falmer Helmet. A Spellsword boss readies his war axe and lightning. Falmer spellsword bosses have the same equipment and loot as the spellsword Falmer listed above, but appear at higher levels. At low levels, Falmer bosses can be much more difficult than normal Falmer; at higher levels, the bosses are actually lower level than regular spellsword Falmer, but have slightly higher stats. 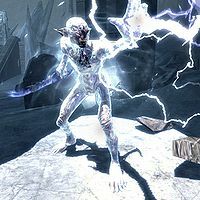 Frozen Falmer only appear in the Dawnguard add-on, and can be found in the Inner Sanctum of Auriel's Chapel in the Forgotten Vale. 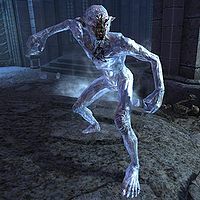 All frozen Falmer are, in fact, Feral Falmer who were encased in ice. They are weak to fire attacks and have 100% resistance to Frost. Frozen Falmer come in two varieties: Frozen Vampire Falmer and Frozen Falmer Shaman. Frozen Vampire Falmer use unarmed attacks in battle. They do not have any weapons or armor, and carry no other items. Frozen Falmer Shaman use spells in combat. Although they do not know the Bound Sword spell, all shaman carry a bound sword with the following enchantments: Banish Summoned (an effect that functions like the Oblivion Binding perk), Soul Trap (5 seconds), and Turn Raised Undead (essentially a Turn Undead effect). Although the Frozen Falmer Shaman have a leveled amount of gold and a selection of other miscellaneous items, all frozen Falmer actually shatter into several pieces and melt on death, so no corpse is left behind to be looted. 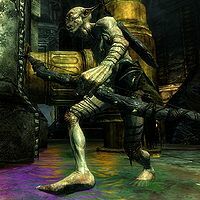 Falmer are typically accompanied by a few monsters, which will vary depending upon your level. The monsters will be the same level as the minimum PC level listed in the table below (so at levels 6-11, the Frostbite Spider companion will be level 6, and so on). Extracting an Argonian: Rescue Derkeethus from his Falmer captors. 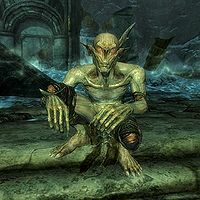 In some ruins, such as Nchuand-Zel, you might see small, two-foot-tall versions of Falmer. 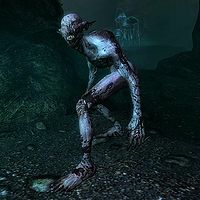 For historical information about the Falmer, see the lore article. This page was last modified on 28 March 2018, at 21:06.